I think what we’ve got with Peter Berg’s Battleship is a prototypical example of the differences that arise between filmmaking and film marketing. 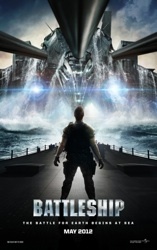 From its precisely and deliberately crafted trailers to its unapologetic brandishing of the Hasbro nameplate, Battleship became inexorably linked with one specific film franchise even before audience members ever purchased a ticket -- or neglected to purchase a ticket, as this weekend’s box office take would seem to intimate. I’m speaking, of course, about inescapable shadow of Michael Bay’s Transformers juggernaut. While it pervaded over every piece of promotional material connected to Battleship, beginning with its outlandish Super Bowl trailer, Berg’s movie contains what I consider only piecemeal portions of Bay's monstrosity. Battleship’s true inspiration lies elsewhere. During February’s F This Movie! Fest, I remarked to Patrick during the screening of Star Trek II: The Wrath of Khan how much I marveled at the film’s relatively small scale of action, given its larger-than-life reputation in science fiction circles. He responded that that was precisely the point -- that director Nicholas Meyer sought to make an old-fashioned naval warfare movie in space. Now, before you pelt your computer screen with produce for my placement of Wrath of Khan and Battleship in the same sentence, let me be clear: Battleship is nowhere the film that Khan is. I’m merely saying that their goals are similar, and that if your instinct is to dismiss Battleship as Bay-knockoff fodder, that instinct would be misguided. Your instincts about the movie having an overly simplistic plot, however, are perfectly on point. Taylor Kitsch stumbles along as Alex Hopper, a screw-up who turns to service in the Navy for some semblance of order in his life, only to continue his screw-up ways to such a degree that he's going to be kicked out of the Navy by his superior officer (Liam Neeson), who just so happens to also be the father of his way-out-of-his-league girlfriend (a barely alive Brooklyn Decker). Of course, his expulsion will only become permanent after his fleet returns from a series of international naval exercises off the coast of Hawaii. Enter our extraterrestrial foes, who plummet into the Pacific and immediately employ an electromagnetic barricade around the entire island, trapping Hopper’s ship, along with two other destroyers, in the battle zone, while the rest of the fleet can only stand down, unable to penetrate the enemy defenses. And that’s pretty much it, folks. Along with a handy beat-the-clock story centering around the aliens calling for reinforcements only when a U.S. satellite is in just the right location for the briefest of moments, Berg isn’t too interested in making Battleship the action genre’s successor to Mulholland Drive. And it’s hardly the point, because these tired action movie tropes (and they’re all there -- unfunny comic relief, ill-conceived sports montages and eye-roll inducing dialogue) are merely a conduit for Berg to deliver an exciting and modest underdogs-overcoming-long-odds story with influences rooted less in Revenge of the Fallen and Dark of the Moon and more in Action in the North Atlantic and Midway. Nowhere is this truer than in the film’s central conceit, which involves a highly advanced extraterrestrial society visiting Earth and choosing to engage in naval warfare, as opposed to just about every other adversarial alien race in movie history. You can poke fun all you want at the fact that the film is based on a board game, but if nothing else, it affirms that Berg’s real aim is to create something of a throwback naval warfare film, based on the most fundamental military strategies. The movie’s board game origins become almost laughably obvious during one sequence, but by that point, I’d been so charmed in by Berg’s gleefully simple strategy that I was able to appreciate the trick for what it was: completely harmless fun. At the risk of belaboring the point, Berg’s interest in an old-fashioned story becomes even clearer with the examination of the alien beings’ method of attacks. Again, he bucks the fiery laser blasts of just about every other hostile visitor we’ve become accustomed to in favor of depth charge-like canisters that lodge themselves in the exterior of the Earthling ships, then burrow further into the hull before detonation. Bay’s tactic of throwing a bunch of clanging metal and explosions at the screen at a breakneck pace is nowhere to be seen here. The attacks are deliberate, calculated and plotted. Before I lead you too far down the primrose path, I would be remiss if I didn’t mention the blunders Berg backs into in birthing Battleship. The casting of Liam Neeson was very intriguing to me, as he has excelled in his recent badass action hero Renaissance in fare like Taken, Unknown and The Grey. The problem here is that Neeson finds himself on the wrong side of the aforementioned alien barrier, enabling him to do little more than growl and bemoan the fact that his daughter has fallen for such a loser like Hopper. Berg has infected us with a case of Liam Neeson blue balls. But even that could be forgiven if the movie’s real hero, Taylor Kitsch, was in any way capable of carrying an action picture. Listen, following the finale of Friday Night Lights, nobody was more in the Taylor Kitsch: Action Star camp than me. But he is really problematic here, occupying every frame in a wide-eyed daze that suggests he dropped out of Mark Wahlberg’s Angry and Confused Action Star University because the midterms were too hard. Between his no-show in Battleship and the underperformance of John Carter (not entirely his fault), I think it might be time to go back to the drawing board for the man the AV Club dubbed a “human air guitar solo.” I think maybe a nice low-key Western is a good starting point. Anyway, I suspect that some might be turned off by the movie’s jingoistic pro-military rhetoric. To those voicing such disapproval, I can only say “lighten up.” This movie has as a political agenda in the same way that something like Top Gun has one -- which is to say that if you’re the kind of person who contemplates a movie like Battleship with any hint of political seriousness, it would seem your opposition has already gotten the better of you. Alex, I've read many reviews and comments on "Battleship." Yours is the first that's actually made me want to see the movie based on how you mention Berg approaches the naval action. I certainly didn't meant to come off as some kind of shameless shill for Battleship, but I just feel like there's more to it than meets the eye. In the non-Transformers sense, that is. I haven't seen the movie (YET), although I've certainly seen enough bottom-crawling "bugs" advertising the movie on NBC during AMERICA'S GOT TALENT that I FEEL like I've seen it. BABA BOOEY! I just reviewed THE GREY a few weeks ago, so I think I'd have a tough time watching Liam Neeson fighting aliens instead of wolves, but I appreciate your even-handed review. This is the kind of movie that will undoubtedly have knee-jerk defenders of the "It's a movie based on a board game, about aliens fighting the Navy. What did you expect?" The question isn't necessarily whether it's great art, but whether it was made by people with passion, or a Frankenstein's monster cobbled together by a soulless marketing machine. Nobody detests the "It's a movie about [inherently stupid thing], what did you expect!!" defense more than me. Berg misses a lot of notes in BSHIP, but to say he made it completely on autopilot to capitalize on the long-since-exhausted alien invasion cache would be disingenuous, in my view. Really? NOBODY hates it more than you?? Come on, Patrick. It was a comment on a blog post, what did you expect?! Or something. Are we doing this right? Actually quite fun. Moronic script, awful performances and has a massive hard-on for the Navy, but it didn't take itself seriously, and is sometimes so stupid, it is hilarious. Good review Alex. Okay, here's the deciding factor to whether or not I go see this: Does anyone, at any point, say "You sank my battleship!!!" Preferably Liam Neeson right before he punches an alien in the face? And before you say it: Yes, I SHOULD be a Hollywood screenwriter. Battleship is a mild guilty pleasure of mine. The late-movie montage set to AC/DC's "Thunderstruck" is a real crowd-pleasing scene.